It’s not just the practice tempo that’s new. The defensive back is on his third defensive coordinator in three years in Lincoln, and his third defensive backs coach. First it was Mark Banker, Brian Stewart and an aggressive 4-3; then it was Bob Diaco, Donte Williams and a scaled-back 3-4; now it’s Erik Chinander, Travis Fisher and an in-your-face 3-4 scheme. Two seasons in a row now, Jackson hasn’t particularly enjoyed watching his previous year’s tape. Last August, Williams chalked up a poor freshman campaign to maturity. Jackson’s now a junior with plenty of experience (and that above answer feels like a pretty strong endorsement of growth in that area). As for 2017, Jackson didn't create a single turnover and only registered three pass breakups in 12 games. To put that into context, at least 50 other Big Ten players had more than Jackson's three. Two of them were defensive linemen. And yet, Jackson's biggest knock might have been his tackling. This year, it's about consistency. “Just being a sure tackler,” Jackson said of his 2018 goals. “Me coming from offense, I’m still coming around. [I’ve] got to make tackles, got to hit big guys. It’s not that I’m scared or nothing like that, it’s just something I’ve got to get used to and I’ve got two seasons under my belt now and I feel like I’m finally prepared and ready to step up to the challenge and make a lot of plays that I need to make. 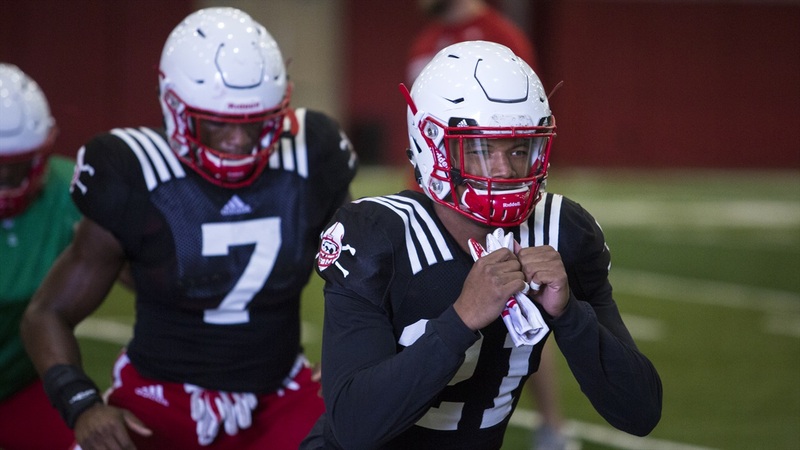 Before the Huskers opened spring ball, Fisher talked about his own move from offense to defense during his playing career. “I basically had a choice to make,” he said then. “I just chose to be physical.” He’s expected the same from each secondary he’s coached. Fisher has been cross-training his defensive backs in order to put traditional cover guys in hitting situations and safeties in coverage. Unlike last year, the safeties and the corners are all meeting together. In the film room, Jackson says they’re breaking down technique, alignment and any mistakes that might happen during practice. But, on the field there’s not much coaching in-between reps; it’s simple: go make a play. It’s that “desire to excel and no fear of failure” motto in practice. Jackson said it breeds confidence. It’s freeing. Whereas last season when the secondary often times looked a step slow thinking about what to do, this year the job is easier. “Now it’s kind of more like a bracket play with the secondary,” Jackson said. “We always know we’ve got help on the inside, we know what to break on and what we don’t have to break on. It honestly makes our jobs easier. There's a Ringer writer that's one of the most beloved figures in the sports media world, Shea Serrano, and he has a battle cry. “Shoot your shot.” This staff has embraced that mantra; Jackson says he hears it often. Shoot your shot, make a play. Jackson loves it.